You do not know who I am? I am Miss Grey. I am the owner of the blog writing lady – well, she thinks, she owns me, but believe me, never, ever was a cat owned by a human being. But let her think whatever makes her happy! And today, now, she wants to write about bugs. BUGS! Why not cats? We are nicer, smarter, more beautiful – okay, my dear, you say bugs, bugs it shall be. We live in a nice flat on the slope of one of Amman’s many hills. Open the door and you will find a nice terrace and a small garden, where the said lady and her husband planted all kinds of trees and flowers. I am not really interested, the trees are still too small to climb on, but they smell good and give some shadow. The problem is, not only I enjoy the shadow, but a not so small number of other creatures also feel themselves attracted. Other than my human family I don’t care about the mosquitoes. They are just noisy, too small to be of any interest. Spiders are something else. Earthbound, they cannot just fly away and laugh about me when I jump and miss them (like the pigeons do every day), they can only run and try to hide under a leaf or in a hole in the ground. Too many holes here, for my taste, all to give shelter to whatever small prey I see in the garden. But the spiders, often as not, are stupid enough to come to the house – and there, on the shiny tiles of the floor, they cannot escape me. I follow them everywhere, push them with my paw so the roll all over the slippery surface. Then I wait a little, let them feel save and, when they start running again, I jump high in the air to drop on them before they see me coming. But spiders, still, are minor prey. And just chasing them, often to the amusement of my audience, would not make me feel really useful in this house. Of course, my dear lady and her husband would still want me to stay, feed me, love me, cuddle me (if I consent to being touched), but the younger ones do not often feel that I am a necessary member of the house. They do not consider that, without my presence, every mouse or rat of the neighbourhood would like to sample their food in the kitchen or participate in the leftovers in their rooms – which often enough they forget to store away decently. And then, there are the most feared of all bugs, the sight of on of them would make every one of the youngsters scream and run. You know what I am talking of? The black, rustling, flying, running species, up to three inches long, stinking, … – cockroaches. Nothing else brings the place in a state of revolution faster than one of those ugly creatures. And then I have my big day, because I am the one who is not afraid to go after it, follow it wherever it might flee, toy with it, shuffle it right and left until its gleaming wings start to look a little bit frayed, it becomes slower, limps and I give it some time and space to recover. Then, again, I see it move. I hide behind a chair or a curtain, let it advance over the floor, attracted by the smell of my food on the kitchen floor. Close to the threshold it comes, and then I lift my backside, my head is stuck to the floor, my whiskers tremble – one big jump and I land on its back, crushing it to an unsavoury mess. No, I don’t eat it. I push the corpse around for a while, but it gets boring and eventually someone will come and pick it up with a piece of paper and throw it out. I lift my tail, go to the fridge and look at my lady: time for a reward. What’s on today, chicken or kebab? BugsYep. Bugs. Simple and easy. Prose, poetry, play. Fiction, nonfiction. It’s all good, all bugs. 😉 It is Miss Grey’s point of view – I, personally, rather deal with the cockroaches. But our boys …. Still, Miss Grey has a point, there. Our local spiders are, as far as I have seen since I am living here, rarely more than 0,5 to 1 cm – including the legs. Most are smaller. So, very tiny toys for her. Yes, I was astonished to see them here, I thought it would be much too dry – but looks like they don’t care. Fortunately, they are not too many. South, at the sea, in Aqaba, I was told people have lots of them to fight with, especially if living in the ground floor. Your cat sounds like a great hunter, and very eloquent! Have you encouraged her to try her paw at poetry? Also, perhaps she could teach my cat about the cockroaches. He doesn’t seem to notice them much, except when they crawl on him. Then he just runs away. Loved the kitty’s perspective on the whole thing. I only saw a cockroach that big once and that was walking down the street in NY City, not just me, it too. Wish I would have had a camera. Wonderful story Miss Grey! You are a very brave cat taking on those terrible bugs! The cats that let me live with them will go after moths or flies, but they leave the spiders alone. Lol, she thinks spiders are moving toys. Maybe when she gets older, she will ignore them. On the other side, our youngest son pretends she brings the cockroaches in from outside herself, to toy with them and show off …. Ain’t she sweet? I love that you wrote it from the cat’s point of view. Very cute. And I never knew one could feed cats Kebabs. I need to remember that. Depends on the cat, I presume. 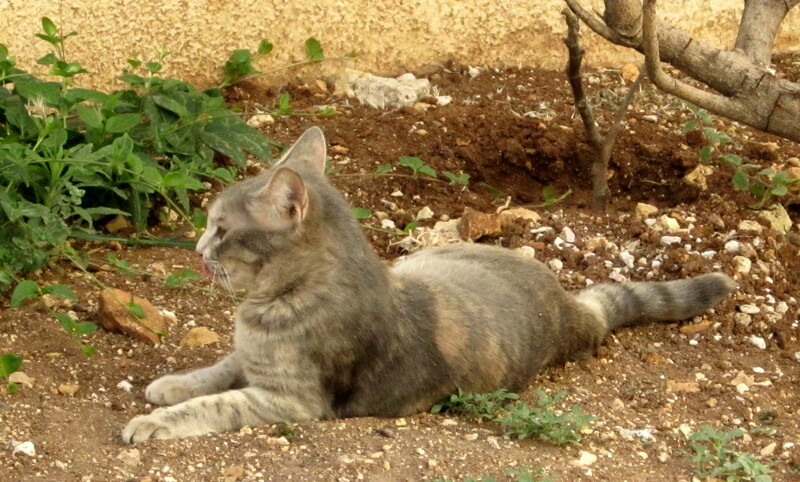 Here in Jordan, cats usually don’t know tinned food – maybe wouldn’t eat it. But they eat almost everything else, only our kitties are spoiled because we get leftovers from a cantine, all kinds of meat, chicken, yes, and kebab, sometimes. Miss Grey prefers the chicken, everything else she will smell at, look at me like: “You don’t have anything else today?” and finally nibble at what there is. But when her favorite servant (my husband) is eating, no matter what, she starts begging (guess, who got her used to it that she will have a bite of everything he eats!) and whatever he chews, she will swallow. Fries with bread, cheese, of course, hummus with bread …. as long as it comes from his hand. I defiantly would second the quote above. I smiled while reading it; Nice post. Cat POVs are always fun 🙂 I for one would rather my pets deal with cockroaches, which are not poisonous and try to eat my food, than spiders who are all venomous and prefer fresh bugs to my humble pizza. Love my cats – but lost this one. Still need to write about that. Spiders here are fortunately usually not poisonous and more like a toy than a meal for a cat. Cockroaches came back after Miss Grey disappeared, but stayed away since we got a new little cat.